Before I begin the review I just wanted to say that I've never thought about getting a new foundation brush. 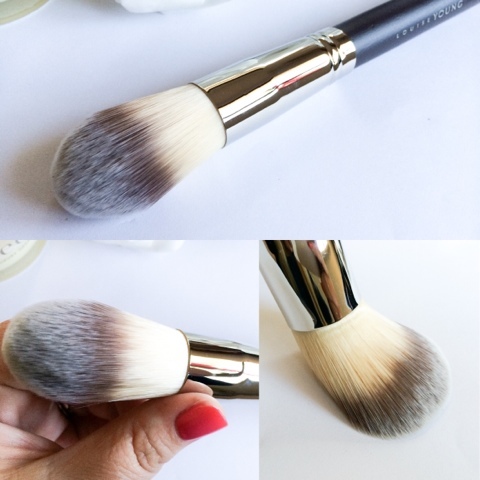 Ever since I purchased the Real Techniques Buffing Brush I have used nothing else to apply my foundation, and no other brush or sponge has come close to achieving a flawless base as quickly or effectively as it (you all know how good it is so I wont ramble on). You can imagine my surprise when I found myself putting this into my basket. In theory it's not a brush that would appeal to me. It's big, the bristles are long and narrow, reminding my very much of the traditional flat foundation brushes, only a fatter, and I never thought it would live up to my beloved Buffing Brush! The Louise Young LY34 'Super Foundation Brush' comprises of synthetic bristles that are tapered at the end to form a soft point. This is ideal for getting into nooks and crannies on the face, like around the eyes and nose, and the bristles which are incredibly soft, (in fact its ridiculous at how soft the bristles are!) don't scratch the face or disturb any dry patches. The long handle and weight of the brush actually makes application of foundation very easy. You put less pressure on the brush so the product glides over the skin, without caking and delivering an almost airbrushed finish. When using this I found I used less product as the bristles didn't soak it up and my foundation applied a lot quicker, it generally doesn't take a long time anyway, but this brush just seems to half the application time. One minute the foundation was blobbed on my face and the next it all blended in seamlessly with no effort at all. Another thing that I found unique about this brush is its ability to sheer down the foundation making it look more natural and skin like but still delivering the coverage which I require. Even when I'm using a full coverage foundation this delivers the light finish of a BB/CC crème but with the flawless coverage of a heavy foundation. I don't know how it does it, but it does and its like no other brush I've tried before. All in all I'm very impressed with the brush and in my mind I think its well worth the money and I'll definitely be trying more brushes out from her line in the future. 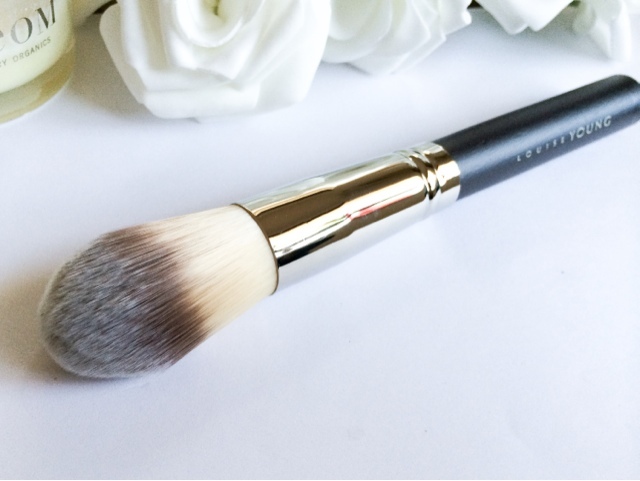 Have you tried the LY34 brush or any other brushes from Louise Young? What's your favourite foundation brush?